After a quiet but fairly grueling week of bouncing between jobs and schoolwork, just about the last thing I want to do is start a whole new project, be it cooking, baking, or crafting. Despite the seemingly endless energy that I pour into these things, right now, I am tired. All of the above will resume, perhaps even before the end of the day, but right now I’m just thinking in indulging a in little Sunday Sweetness, and taking the day off. Baked mostly for looks, but thoroughly enjoyed nonetheless, this tantalizing chocolate and vanilla number was my creative representation of bit depth and pixels for my Photoshop for Photographers class. My favorite sort of homework comes with a tasty reward at the end of a photo shoot, so I could hardly resist the concept! Though I still have yet to discover my grade, those simple little cakes are already long gone. But I wouldn’t leave you hanging, no way! I want to share this sweetness with you too. So, here’s a little bonus for being patient while I work on writing a real post: A free wallpaper! Click for the full size photo, right click, say “set as wallpaper”, and then instruct your computer to “stretch” the image so that it properly fits your screen. It’s big enough that it should be able to accommodate everyone, so be nice and share, kids! I did just set my background as your beautiful cupcakes! Thanks so much, I love the colors! Hannah,that frosting looks sooo good!!! !Beautiful picture! YAY! These put such a smile on my face, Hannah! They are like a circus in cupcake form, they are happy and silly and just stunning. I love them and I bet they taste delicious, too! That’s a great picture! I love the tower of frosting on those cupcakes. Beautiful photographs and little cupcakes :D Put’s me in the mood to bake today. I think your grade is an A+. They look so good. Almost too pretty to eat. Your photos are always well thought out and lovely. Gorgeous photo. This is the cheeriest wallpaper I’ve ever had…thanks! They look so happy and celebratory! They’d be perfect for my son’s birthday. I’ve had a pretty grueling week too, nice to look at happy cheery cupcakes. Oh, these are such *happy* pictures! Enjoy your well-deserved rest – look forward to hearing what you’ve been up to when you get the chance. And good luck with your grade! These pictures are gorgeous. What a cool class! I said “set as wallpaper” and nothing happened until my boyfriend took the computer and set the picture as wallpaper and said “Here you go”, looking at me like if I was crazy ! Those cupcakes look gorgeous and I would pay a one way ticket just for the taste ! Good luck for next week at school and work ! Until then, enjoy your Sunday ! That is for sure one beautiful wallpaper Hannah! Or I should say beautiful photo really. Love the colors in all your photos really as it just pops and makes me happy just looking at them! GORGEOUS CUPCAKES and YAY for the wallpaper! Now that’s a sweet happy pic- perfect for a Sunday or anyday! Yum. That big fluffy mound of frosting/whipped cream is exactly what I need right now. Fun homework! these looks so cute and delicious! YUM! 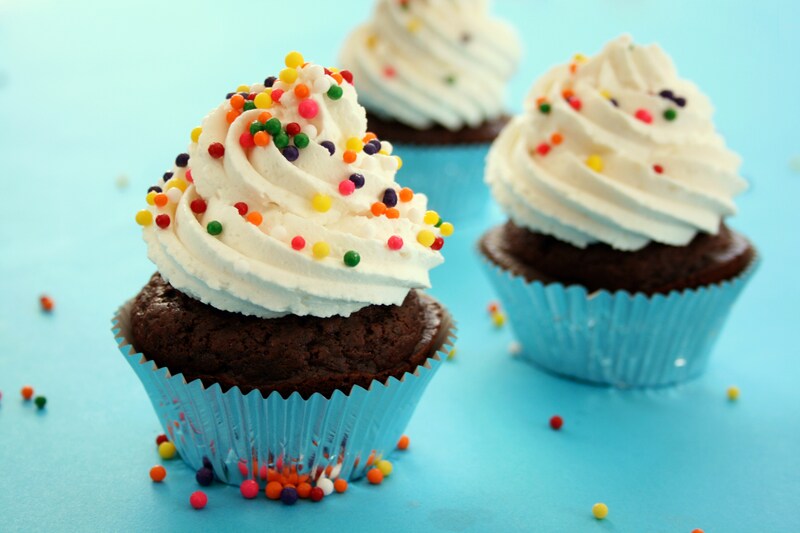 I wanted to make cupcakes today but didnt have time:( what did you use for the frosting? it looks delicious. A well-deserved Sunday off! Hope you enjoyed it! That looks delicious! Now I’m going to get hungry every time I look at my desktop. But seriously, gorgeous pic and thanks for making it available as desktop background. I wish my work assignments were so sweet (har har ;p). But these really do look tasty. Sometimes the simplest treats are the most satisfying. Gorgeous looking cupcakes! Making me hungry!! Beautiful photograph- how on earth do you get everything to look so very perfect AND scrumptious! It is hard to concentrate on work with those cupcakes staring back on my wallpaper. Thank you for the inspiration! Ohhh…more cupcake goodness! I’m making a cookies ‘n cream version later today and can’t wait to get my fingers in the frosting! That is gorgeous, great picture! Thanks for sharing! These cupcakes look so delicious! now I want some!! !